in the same way that everyone has a hot dog horror story, i feel like most people have had a horrible experience with goat cheese (chevre). maybe you mistook it for whipped cream during dessert at that farm-to-table restaurant, or you threw it up after consuming a rancid breakfast burrito. 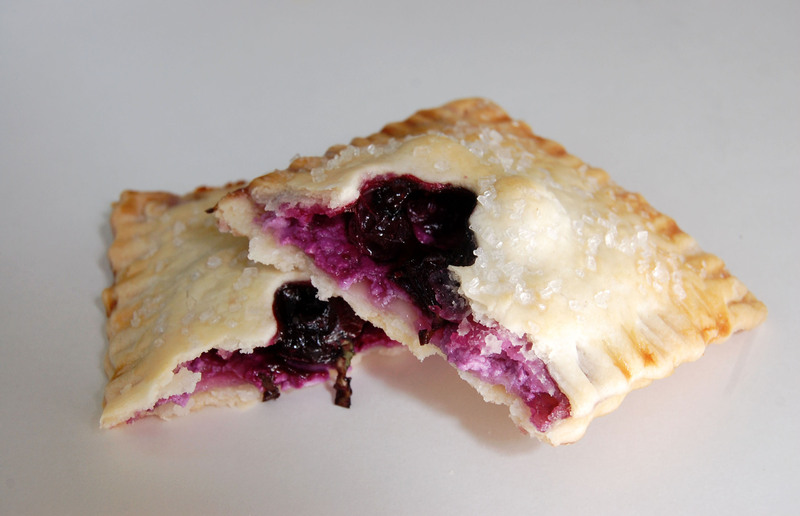 it can be overpowering if utilized incorrectly, but it can also take on flavor really well, as it does in these handpies. i started with pre-made pie crusts because i don’t hate myself (pie crust from scratch is so easy blah blah okay), then layered on the chevre, blueberry compote, fresh basil, and honey. the chevre melts into the crust, providing a creamy foundation and preventing the compote from soggify-ing everything. 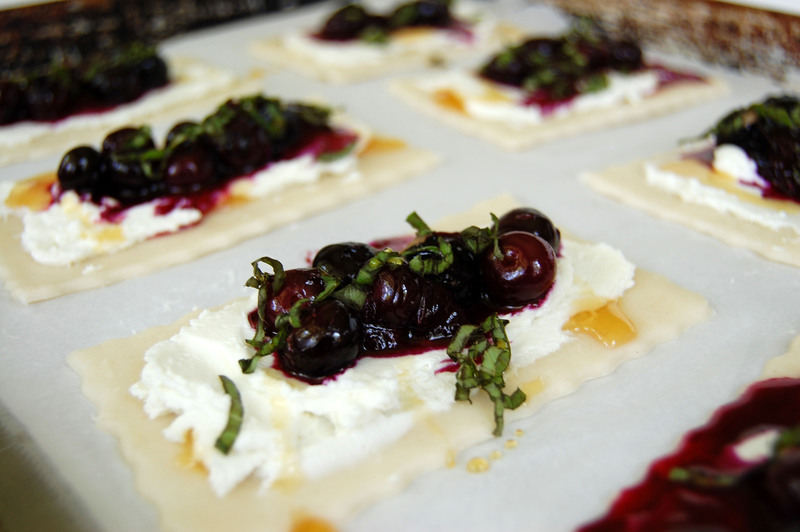 basil plays with the cheese’s savory side, and honey brightens the fruit. make these in the morning, wrap them in brown paper and twine, and bring along on a picnic!! let the crusts come up to room temperature. cut out 16 rectangles, roughly 4 inches long and 2 inches wide. 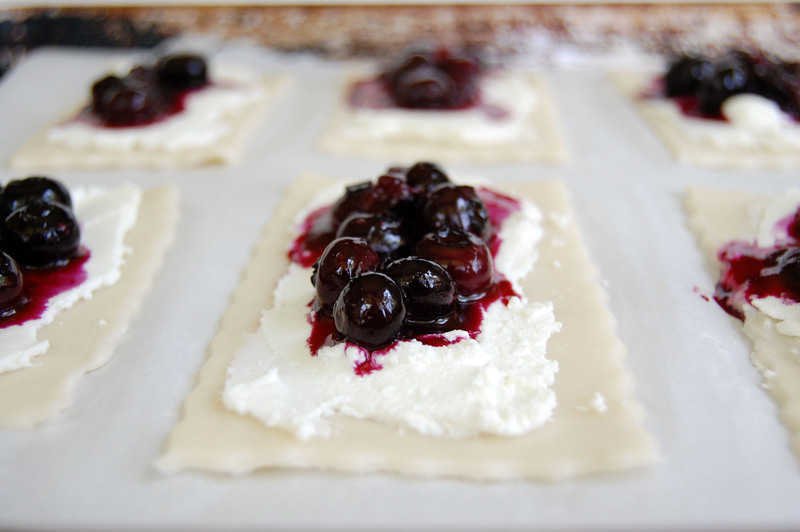 spread a good bit of goat cheese onto 8 of the rectangles, leaving a 1/2 inch border on all sides. for the compote, combine 1/2 cup of the blueberries with the lemon juice, zest, and 1 tbsp water. heat over medium in a small saucepan until the mixture thickens, about 5 minutes. stir in the remaining blueberries and remove from heat. chiffonade the basil (stack and roll leaves then slice into thin strips perpendicular to the roll). 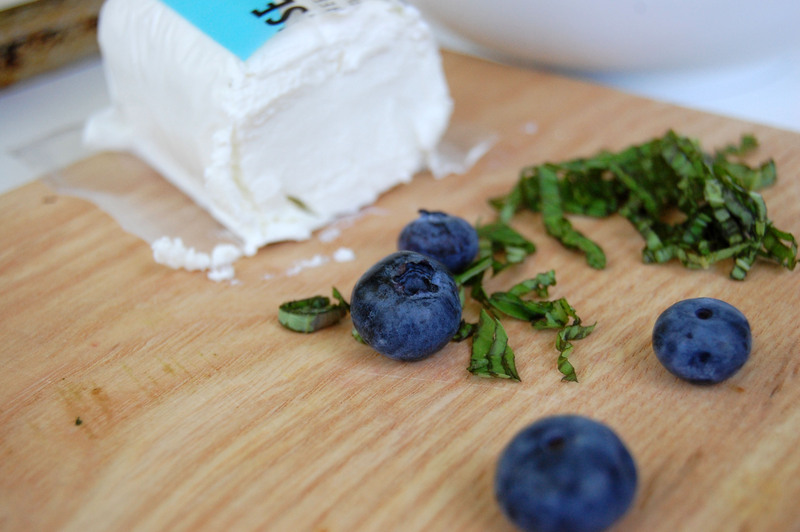 using the back of a spoon, create a well in the center of each goat cheese spread, then spoon in some compote. sprinkle with basil and drizzle with honey. use a small cookie cutter (i used a star) to cut a shape out of each of the remaining rectangles, then lay them over the prepared crusts. crimp the edges with a fork. 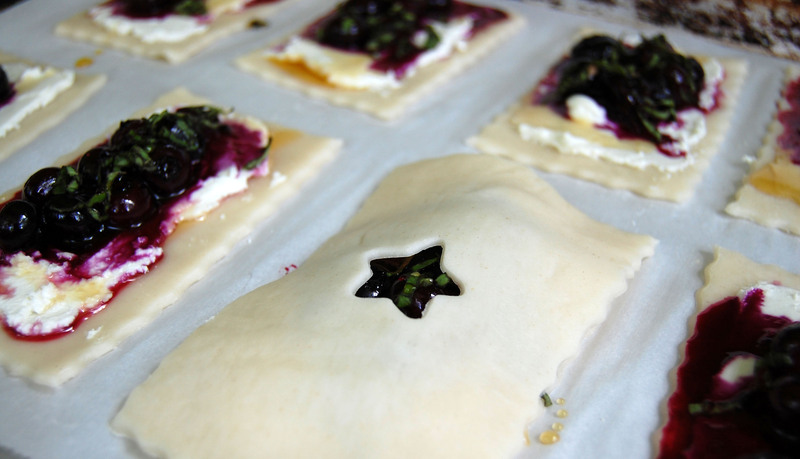 preheat the oven to 350º and transfer the handpies to a parchment lined baking sheet. whisk together the egg with a few drops of water to create an egg wash, then brush it generously over the pies (spots you miss won’t be golden!). sprinkle with sanding sugar then bake for 15-20 minutes. 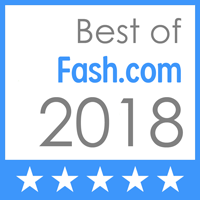 best the day of!